Mr Monkey jumped aboard a 192 on the A6, hoping to get to Manchester for the press night of Into The Woods. After an accident on the M60 caused tailbacks all on the A6 Mr Monkey forced his humans to abandon the bus, scamper through Stockport to a point where the traffic was moving, and to catch another bus into the city. This meant he arrived at the theatre about ten minutes after the start of the play. He feared that he wouldn't be allowed in, but a pair of very nice front of house chaps found him a seat in the upper gallery that he could get to without upsetting too many people. After the interval he went to the seats he actually had tickets for, to get a different view. First produced in 1986, Into The Woods imagines what would happen if several fairy tales happened at the same time and place. A baker and his wife, who happen to live next door to a witch, find that she has cursed his family and that the curse can only be lifted if they bring the witch a milk white cow, a red cape, some hair the colour of corn, and a golden slipper. This means the baker and his wife have to track down Jack (of the Beanstalk), Little Red Ridinghood, Rapunzel and Cinderella. Each of them have more complex characters and motivations than the average fairy tale character, and the baker and his wife don't always agree on the best way to achieve their quest. The second act is far darker, dealing with the aftermath of everyone getting what they wanted at the end of the first act. Ever after turns out not to be as happy as everyone expected. The set appears quite simple, just four tree stumps, each large enough for an actor to hide behind, with a sort of crossroads or clearing between them. When needed, the tree stumps grow into tree trunks and a canopy of branches descends to meet them to form the fearsome woods that the characters are always going into. Mr Monkey found watching this happen quite magical; looking down from above and up from ground level. The sense of being in the woods is increased by the real trees surrounding the outside of the theatre pod, blocking the audience's view of the stage when walking around the outside and giving a view of just trees when sitting in the seats and looking out. Mr Monkey was also deeply impressed with Little Red Ridinghood's grandma's house, which not only features detatchable walls but is also home for a splendidly gruesome scene in which both Little Red Ridinghood and her grandmother are rescued from the belly of the wolf. Throughout the play, music is provided by a talented musical ensemble who are visible to most of the audience. Mr Monkey felt that being able to see the musicians vastly improved the whole experience. 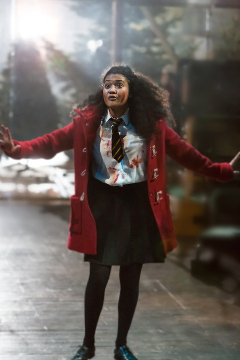 The cast are excellent throughout. For Mr Monkey, the most memorable performances were Natasha Cottriall as Little Red Ridinghood and Gillian Bevan as the Witch. The quality of the singing was excellent, especially that of the Witch and Isabelle Peters' Rapunzel. Every word can be heard properly, except possibly during some crowd scenes were each character is a singing different words to the same tune at the same time. Obviously, this is deliberate. The first act is very funny, though Mr Monkey notes that the humour is adult. The second act is shorter and much darker and serious. Some scenes - cutting the wolf open, and using a knife to make the ugly sisters' feet fit a shoe - hark back to the original folk tales, before the Victorians tidied them up. 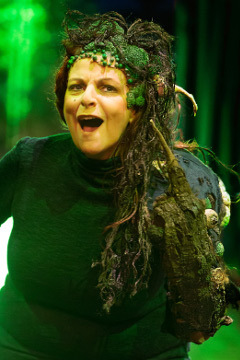 While Into The Woods features fairy tale characters it isn't standard panto fare aimed at children. 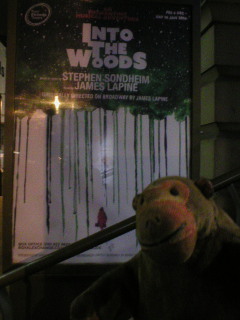 Mr Monkey thoroughly enjoyed this production of Into The Woods, and recommends it to everyone with an interest in musical theatre or folk tales(except possibly small children). 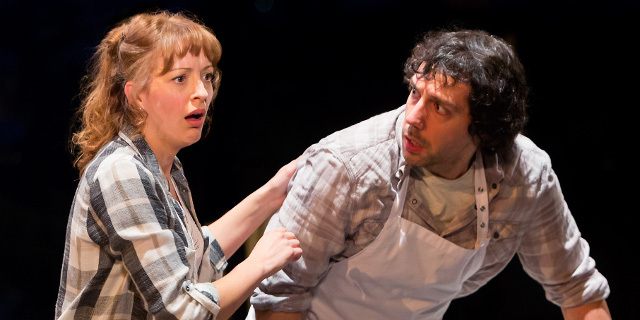 Into The Woods runs until 16th January 2016.